by Dave from The Longest Way Home ~ May 2nd, 2018. Updated on June 6th, 2018. Published in: Travel blog » Nepal. About 12 years ago in Nepal there was a massive dog cull to deal with the out of control dog population problem within the country. The numbers reduced dramatically, as did the number of dog bites. However, international animal rights protests and the Nepali love of dogs largely put an end to this. Various other methods such as sterilization, caring, housing and education have been introduced since then. However, all have ultimately failed to control the number of stray dogs in Nepal. 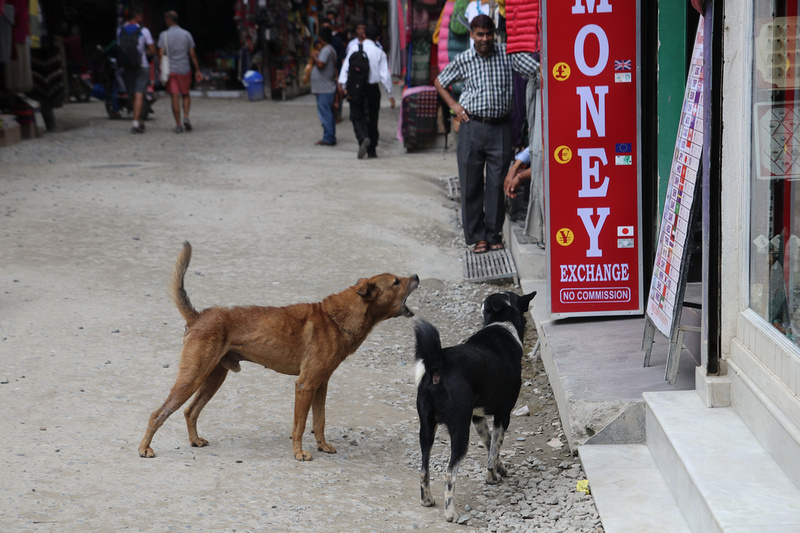 Today there are an estimated 30,000+ street dogs in Kathmandu and the number is rising. In one hospital alone, in Kathmandu, there are up to 150 cases of dog bites per day! In that hospital four patients died of rabies during one year. In 2018 the news got started to hit home with five Nepali fatalities in one month alone. (source). This page will show you why there is a problem, how to avoid street dogs, what to do if you are threatened by dogs, what to do if attacked and what to do if you are bitten by a dog. This article has not been written to warrant a discussion of what can be done about the street dogs. The dog has a religious bearing and there is even a day dedicated to a festival of the dog in Nepal. It is a guard for people and for housing. It is a living creature. For some it is even a means to create a profit by creating a “save the dog” type organization and receive international donations. For some tourists they see a street dog and feel sorry for it. They feed it and care for it. Some even make pets of the dog for the duration of their stay and become “best friends”. Then the tourist leaves and the dog … Some say the people they entrusted will look after it. Others say little. The reality again is something few want to deal with. 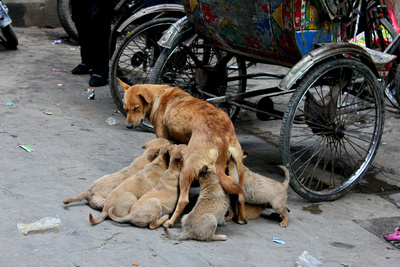 Indeed there are many organizations in Nepal set up to protect street or stray dogs. Rehabilitating them, feeding them, caring for them and promoting their protection. Some even neuter them before putting them back on the street or up for adoption. Meanwhile, for many more tourists and locals in Nepal street dogs are a menace, disturbance and life threatening danger. This page is about how to stay safe from dogs in Nepal. There’s a thin line here. But a street dog has a human owner “somewhere”. Whereas a stray dog has none. In Nepal, in terms of walking along a street or road at night there is very little difference when either come out barking aggressively at you. While this article may seem overly precautious or worrying to some, it is written as a reality check. I’ve met many tourists who’ve either been bitten or threatened by streets dogs. Been kept awake all night by barking dogs. Or much worse ended up in hospital calling insurance companies and panicking over rabies vaccinations. I have also been attacked, bitten and chased by street dogs on countless occasions and can’t stand animal cruelty. Very little physical on the ground solutions are successfully being enabled. So the best solution is to be aware of the situation. There’s no panic needed nor should you be overtly worried. But, you should be aware. Where are the stray dogs in Nepal? 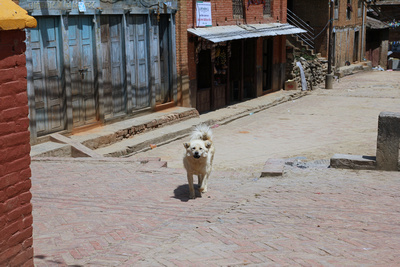 For tourists you are likely to encounter stray dogs just about everywhere in Nepal. From big cities, to villages and along mountain treks. There really is no escaping stray or “street” dogs. Not all dogs are stray dogs. Many are simply untrained local dogs. Treat them all the same. If you are exploring old heritage sites along Nepal’s streets you are likely to encounter them sleeping in the sun. Or guarding their spot by a house. At night they roam in packs along the same streets. 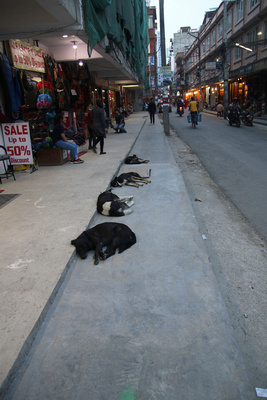 Thamel, which is a popular tourist accommodation area, is known for barking, biting and roaming dogs at night. When garbage collectors come with their bags, or indeed anyone “scruffy” with a large bag walks along, the dogs jump up and start barking and trying to chase them off … great for keeping “undesirable people away” bad for tourists and recycling. In Pokhara, Chitwan and other lesser dense areas the dogs are easily heard at night. Many sleep in bushes, relatively well hidden until startled and they jump out at you. In the mountain treks dogs can either be wild, abandoned or left to protect an area. 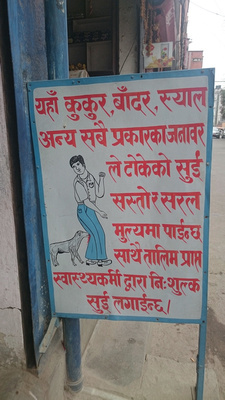 Do make sure you have your rabies vaccinations before coming to Nepal. While snakes and monkeys are also rabies carriers it’s mainly dogs that infect humans in Nepal. Do not feed any dog in Nepal – doing so only encourages them to approach other tourists who may not be able to deal with a dog! Not all rapidly approaching dogs are dangerous. Many dogs have been treated well by tourists compared to locals and are often very excited to see an affectionate tourist! Ultimately, avoidance is the best solution. Aside from attacks, street dog noise has been a growing problem particularly at night. Earplugs are the only solution. Do however let your own voice be heard by telling your hotel management you were disturbed by dogs barking. Hotels are part of the local community and want you to stay there. They are highly likely to become proactive if the problem means there’s a likelihood you won’t stay with them or give them a good review. Likewise do give the Nepal Tourism Board feedback as without it they cannot act. Culturally, many Nepali are not disturbed by barking dogs at night as they grew up with it. Meanwhile many tourists are kept awake as they were brought up that his sound means something is wrong somewhere. The hospitality industry is yet to take this seriously. What to do if a dog attacks you in Nepal? Do not let a pack of dogs encircle you! Back yourself against a wall, door or tree if possible. An attacking pack of dogs in Nepal often try to encircle a target before taking it down. Avoid falling at all costs! Do read more about dealing with attacking dogs. Once you are clear of the dog, seek immediate medical attention! A rabies shot sequence will likely be necessary. As will a tetanus shot. Another reason to make sure you have travel insurance when visiting Nepal! Only after you have received medical attention should you report the attack to the police, tourist police and Nepal Tourism Board. Will dogs continue to be a problem in Nepal? For the immediate future, yes. 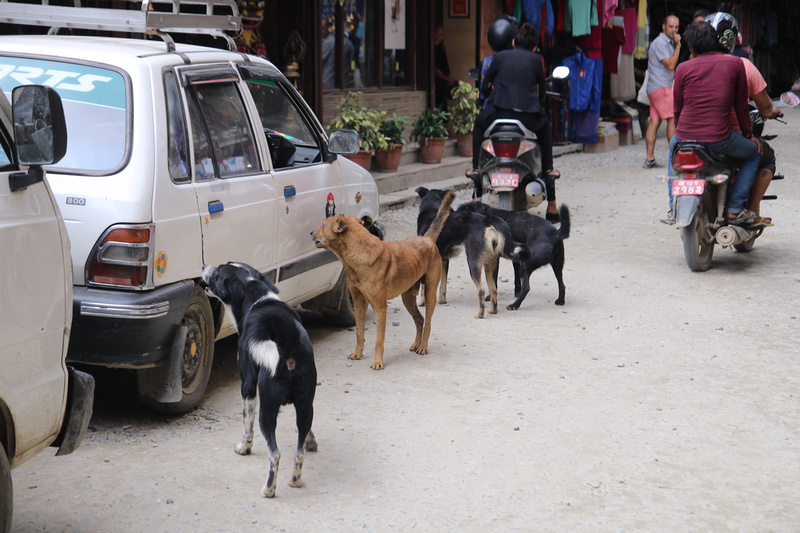 In Kathmandu the Municipal Council have said that they would tackle the street dog issue via sterilization in 2017. For many sterilization has not been enough nor effective. The remaining sterilized dogs go back on the streets contining to be a menace to all tourists and locals alike. For those that say that many dogs are silently rounded up and inhumanly destroyed. Evidence is needed and clearly it’s still a problem. Moreover, the stray dogs from surrounding towns often move to the bigger cities. It is also not just a Kathmandu problem, but a nationwide problem that constantly grows. Sadly it seems that until such time as a high profile tourist get mauled there does not seem to be enough “will” to change the dog situation in Nepal. A solution that’s not been implemented: Aside from nationwide education. One simple solution is to have all dogs along with their owners licensed and saved in a database. With 24 hour electricity now in Nepal there is no reason this system should not work. A simple 200 rupee license fee and collar would be enough to make the project fund itself. Moreover the fee can be increased within city areas and decreased rurally. Any dog found without a license can then be freely rounded up and taken to a kennel. What happens after that? Again, the 200 rupee fee could be used to house dogs without a license along with fines for those without licenses who wish to reclaim the dogs. Likewise licensed dogs could be muzzled in certain areas or only allowed out on a leash. Moreover, this could also lead to cleaner streets if dog excrement clean ups were enforced per owner as well. Neutering could be made mandatory along with dog and owner training depending on dog numbers. The licensing program could also help with funding this. For more funding some of the internationally funded animal rights groups can have a new challenge. Meanwhile, stay clear of dogs in Nepal is ultimately your best form of protection. (previous post) « Making a trip to Nuwakot before it’s gone! Interesting article. I’d like to know how other countries deal with stray dogs. It might help Nepal. Most seem to have a neutering and licensing policy. However, some have simply said with out of control situations packs of stray dogs need to be treated as pest control. It’s sad that tourists take dogs and then leave them behind. We found a dog on a road trip and took him home. Yes, it’s been a common trait in Nepal for decades. It is possible to take a dog out of Nepal and back home but you’ll need to pay for certificates, vaccinations etc,. I think dog licensing should be mandatory with fines for those who don’t keep dogs inside at night. We were really kept awake in Kathmandu this year. Yes, barking dogs throughout the night is a common complaint. It’s good to know this before we go in November. Never thought about it! Thanks. Are cats also a problem in Nepal? Not really. It’s seems cats are not that well liked in Nepal. Of course some people like them, but they are not as commonly found as dogs. So sad to see dogs like this. Why didn’t the neutering work? Neutering costs money. Who pays, is the common issue. The neutered dogs are usually placed back on the streets again. Village dogs are rarely neutered. Packs of stray dogs shouldn’t be allowed anywhere. They will gather and hunt. If food becomes and issue they will attack people. It’s quite simple what needs to be done. Then, neuter the remaining dogs. Yes, large packs are a problem in many countries. Ignoring the problem doesn’t make it go away. Like above, never thought of a rabies jab. Thanks! It’s always good to check out what vaccinations you may need before traveling! I had this same experience on the streets of Thimphu, Bhutan. Packs of dogs are making the streets unsafe after sunset. 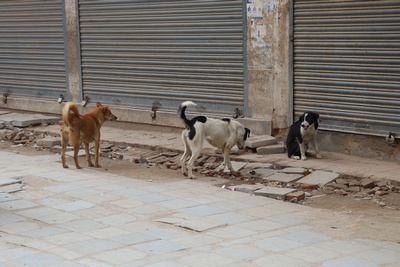 The authorities have sought to reduce the number of street dogs through various measures. It seems like it boils down to their Buddhist unwillingness to take lives. Yes, as above. The god is treated as very special in Nepal. Sadly, dog training isn’t. So, treating stray dogs as a “pest” is very unlikely. Definitely gotta be aware of the street dog situation in KTM Dave. We noted quite a few in 2013. Much less than say Bangkok or, different parts of Bali overrun by street dogs but still, pretty thick. Be cautious. Treat loving dogs with care, but do avoid the more cheeky ones. Unfortunately the numbers are growing. You know I have never thought about this as an issue. I travel to South America pretty frequently, and there are stray dogs all over the place, but I have never really seen them as a threat like that. Yes, Thailand also has a similar issue. Nobody has an “issue” until it’s too late. Last week packs of stray dogs in India attacked several children in villages.